In the century that’s elapsed since the dawn of commercial aviation, air transportation has become pretty well refined. Yet paradoxically, it’s easier to fly halfway around the world than to travel to a nearby city. As a result, many people shun air travel when taking short trips. Consider the process: From an origin point, you must first travel via car or rail to an often-distant metropolitan hub airport. Then, you wait in line to pass through security. You wait some more to board at the gate. You and your fellow passengers wait still more to taxi to the runway before your plane finally takes off. Then you repeat most of the ordeal in reverse on the other end, having spent approximately 70 percent of your travel time on the ground. It’s little wonder that in the United States, 10 percent of round-trips between 800 and 1,600 kilometers (500 to 1,000 miles) and less than half a percent of those under 800 km are undertaken by air. Putting up with the delays and inconvenience would be easier if short-haul air travel were less expensive than surface transport. It’s not, though, largely because takeoffs and landings with small jet engines burn large amounts of costly fuel. In contrast, cruising for long distances, especially with to Back then, airline operators in the United States made greater use of the airports spread throughout the country—now there are 13,500 of them, the most of any nation in the world. Just 1 percent of this vast number of airports carries over 96 percent of air traffic. Unsurprisingly, regional door-to-door times are worse today than they were 50 years ago. And it is not just individual airline passengers who suffer from having to waste half the day schlepping to and then waiting around at large airports. In the globalized economy, communities without good air service struggle to attract investment and create jobs. To undo the damage, we and others are looking to hybrid-electric aircraft propulsion, a system made possible by the convergence of technological trends in battery development, high-power motors, and power electronics. When we began in 2013, no one in commercial aviation was thinking in these terms. At the time, electric propulsion was not considered remotely feasible, except perhaps for a very light trainer. But as we looked at development trends for batteries, motors, power electronics, and almost as important, the regulations that support the industry, it became clear that the technology would come of age in the early 2020s. Aircraft development typically takes five years or longer, which is why our company, Zunum Aero, embarked on its mission right away rather than waiting for the technology to mature. This decision has paid off, and we have brought these technologies together in Zunum Aero’s recently unveiled design for a 12-passenger hybrid-electric airplane, which we’re building now. We plan to conduct our first flight tests in 2019. Beginning in 2022, we plan to sell these planes to airlines, perhaps including JetBlue, which together with Boeing is backing our efforts. Other players have more recently entered the fray, and we welcome them: Their decision validates our concept. We expect our plane to offer 40 to 80 percent lower operating costs than those of regional aircraft today, which would save passengers money and greatly reduce the noise heard in the cabin and down below on the ground. As hybrid-electric short-haul flight spreads, it will reinvigorate thousands of underused regional airports, slashing door-to-door times for travelers. What’s more, the new propulsion system will lower carbon emissions from aircraft by up to 80 percent, rising to 100 percent when short-haul planes become fully electric in the 2030s. Sure, there’s a lot of work to be done to get there. But we’re not starting from square one. Zunum is adapting for aviation many discoveries already made in the development of hybrid-electric automobiles, buses, and ferries. The substantial investment and rapid innovation in vehicle-drive technologies, helped along by the breakneck pace of growth in consumer electronics, has provided an opportunity for hybrid-electric propulsion to revamp aviation as well. The hybrid-vehicle market has come a long way since the advent of the Toyota Prius in the late 1990s. Just a few thousand of these pioneering vehicles were sold stateside in the year 2000. In 2017, nearly 400,000 hybrid-electric vehicles left U.S. dealers’ lots, offered in about 60 different models from more than a dozen manufacturers, according to data compiled by HybridCars.com. That sales figure actually fell from a peak in 2013, when about half a million hybrid-to-electric cars sold domestically before lower gasoline prices temporarily chipped away at their appeal. The effect was to spur technological development of hybrid-electric drivetrains and components, many of which can be either used directly or mimicked in electric flight. Meanwhile, widespread adoption of hybrid diesel-electrics for municipal bus services has led to key advances in onboard energy management. This process involves computer-driven switching between batteries and conventional fuel, to save money on energy and to ensure that the bus has the range to cover its route before it needs to recharge and refuel. The same concept will, of course, apply to the efficient, cost-effective, and safe operation of hybrid-electric aircraft. The maturation of these technologies on terra firma has even started to translate to water transport. Hybrid ferries using a variety of energy-reaping methods—including solar and wind—to charge batteries alongside traditional diesel engines are now operating in some cities, including New York and San Francisco. Norway launched the first all-electric car ferry and commercial fishing boat, which entered service three years ago. And a recent report shows that 70 percent of that country’s fleet of 180 ferries could readily change over to hybrid- or battery-based propulsion. Batteries Are Included: Zunum Aero’s regional hybrid-electric plane stores lithium-ion batteries in the wings for supplemental power, particularly on takeoff. Cruising power is generated by a gas turbine linked to a generator, in the back. A common denominator in these efforts is better batteries, above all lithium-ion batteries, which continue to pack ever more energy into lighter cells. Such energy density is especially critical for aviation. Since 2010, battery pack costs have fallen from US $1,000 per kilowatt-hour to less than $250/kWh today, with a concomitant increase in energy density. Other critical technologies, such as supercapacitors and power converters, have likewise improved by leaps and bounds. Our aircraft is powered by a pair of low-pressure ducted fans, each driven by an integrated 500-kilowatt permanentmagnet motor. The fans provide high static thrust for takeoff, high efficiency for cruising, and—in part because of the ducting—significant reductions in noise. Indeed, this design produces between a third and a fifth less noise than do traditional jet engines and turboprops, allowing our design to serve airports near towns without bothering the residents so much. We call these ducted fans “quiet electric propulsors” (QEPs). The QEPs draw electricity from batteries, supplemented by a 500-kW generator driven by a small, highly efficient gas turbine. The gas turbine doesn’t produce thrust, just electric power to drive the QEPs. It shuts down when it isn’t needed, saving fuel. The combination forms a series hybrid-electric power train, which is managed by a control system that minimizes the pilot’s workload while maximizing system efficiency. We stow the batteries in the wings, where fuel tanks would normally reside. These batteries are designed for quick swap-outs at airports should there be too little time for an adequate recharge. Their cells have a minimum power density of 350 watt-hours per kilogram—a level now becoming readily attainable and enough to meet the aircraft’s power needs. Advanced lithium-ion cells currently provide this energy, but we are intentionally designing our planes to be flexible about the battery chemistry used, given the incredible pace of innovation in this sphere. 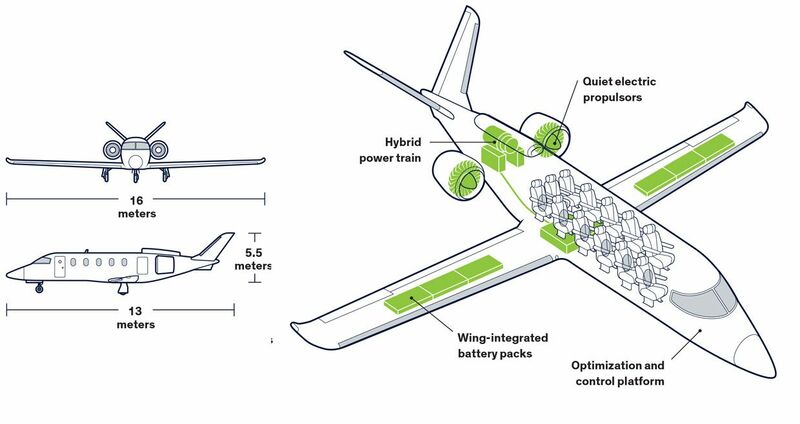 In this way, the aircraft will be future-proofed and ready to accept the latest chemistries and form factors that the battery industry provides. We have developed proprietary algorithms specific to aircraft to optimize performance and range. The system first develops a minimum-energy plan for the route and then monitors and updates the plan in flight based on sensor readings from the onboard motors, batteries, and fuel tanks, as well as from real-time flight data and weather reports. Such methods have already eased the job of pilots in steering airplanes using what are known as “fly by wire” systems. Here it is a power-by-wire experience, with the power-optimizing control system seamlessly managing the loads and sources to achieve the thrust and range needed for each phase of the flight. Built-in fail-safe conditions, such as redundant power and cooling paths for critical power-train equipment, will further ensure successfully getting from point A to point B. Our primary concern for the fan and power train is total propulsive efficiency at minimum weight, because even subtle changes in design details can have a big impact on the power required, and hence on aircraft performance. Because we plan to deliver a Zunum plane to our first customer in 2022, we have established precise testing milestones for the coming 18 months. These include producing a “copper bird”—a model of the electrical systems—at a testing facility in Illinois. At the same time, we will put a subscale model of the QEP in a test cell to evaluate its performance and aerodynamics. Next, we’ll take our power train aloft on an existing airframe to gain flight experience. Then we’ll integrate it with our own aircraft. Meanwhile, we are using computer simulations to determine how big the various components should be and to optimize overall performance. A big part of our preliminary work involved developing the tools and methods for optimizing a hybrid-electric aircraft. Only afterward were we able to start looking at the sizing, which now extends far beyond just the four to six passenger seats we originally envisioned. At one point, we were writing a proposal for NASA for a 150-seat single-aisle aircraft. It was impressive how well the advantages of the technology held up at this size (albeit with shorter ranges). That was when we realized just how big our opportunity was. Although the hybrid design of our 12-passenger craft is unprecedented, it makes use of components with established flight records. The importance of aircraft safety and reliability typically requires a rigorous process of qualification to advance the technology readiness level (TRL) for any product. That is part of the reason for a long development cycle and the slow adoption of new technologies for aircraft. The Zunum power-train team is therefore making use of tools, technologies, and methods that have proved themselves over decades. So, while a particular piece of new hardware may be only at the proof-of-concept level, all of the underlying technologies that support its design are at mission-proven TRL 9, the highest level. This approach has allowed us to accelerate our development cycle, rather than having to reinvent the wheel—or wing, as it were. The Zunum Aero 12-seater will offer many attractive features to operators and passengers. Service will be flexible: walk-on and walk-off, more akin to hopping on a bus or train than boarding an airliner. The direct costs for energy and maintenance work out to 8 cents per seat mile, or $250 per hour for the aircraft, comparable to the economics for conventional airliners. The hybrid-electric range enabled by the propulsion system is 1,125 km, well suited to converting day- or day-and-a-half-long road trips into a mere few hours. Consider a trip from Boston to Washington, D.C., a distance of 640 km (400 miles). By car, the journey takes more than 8 hours. By air, using the traditional hubs of Boston Logan International Airport and Ronald Reagan Washington National Airport, the estimated door-to-door travel time clocks in at around 4 hours and 50 minutes. Flying a Zunum plane out of secondary airports, though, could get passengers from door to door in as little as 2 hours, 30 minutes. Electric flight will probably be cheaper, too, because of its greatly reduced fuel costs. According to the economic analyses we’ve done, average fares from regional Massachusetts airports in Beverly, Hanscom, and Norwood to regionals in Maryland and Virginia such as College Park, Washington Executive, Manassas, and Leesburg would cost about $140 one-way—fully a third below today’s average commercial rates, as reported to the Federal Aviation Administration. Significant hurdles remain, of course, before Zunum can change the way people fly. But these challenges are being met. On the regulatory side, for instance, we are working with other business and government partners to help the FAA craft a new framework for the certification of electric aircraft, which is expected to be rolled out later this year. With continued advances in electric propulsion, we can see in the not-too-distant future a time when hybrid-electric aircraft will become all-electric, and even long-haul carriers will begin retiring their fossil-fueled fleets. Energy-storage technologies still have a long way to go to meet the requirements for all-electric aircraft propulsion, but the motivation will be strong. Currently, the international aviation sector contributes about 2 percent of global carbon emissions. With the climbing rates of airline travel, especially in developing countries, this level is expected to rise to 5 percent after 2020. In an effort toward responsible stewardship of our planet, 191 countries agreed at a 2016 assembly of the International Civil Aviation Organization, in Montreal, to limit aviation emissions to 2020 levels or to pay carbon-offset fees. Hybrid and electric aircraft will figure prominently in accomplishing this goal. Change is in the air, figuratively, and, soon, literally. And it’s been a long time coming. After all, the Wright brothers used gasoline in their historic 1903 flyer. Following the rollout of hybrid and electric vehicles onto our roads and just now entering our waterways, conventional fossil-fueled aircraft will likewise become relics of the past. Air travel, which has been increasingly relegated to fewer and fewer connecting points, will become personal and local again. In a few years, traveling a thousand kilometers will be as simple as arriving at your nearest regional airport, strolling onto a hybrid plane, and taking a quick flight to the regional airport closest to your final destination. There, the car you rent will, no doubt, run on electricity, too. Matt Knapp is the founder and aero chief engineer of Zunum Aero, in Kirkland, Wash. Waleed Said is Zunum’s chief technology officer of power.